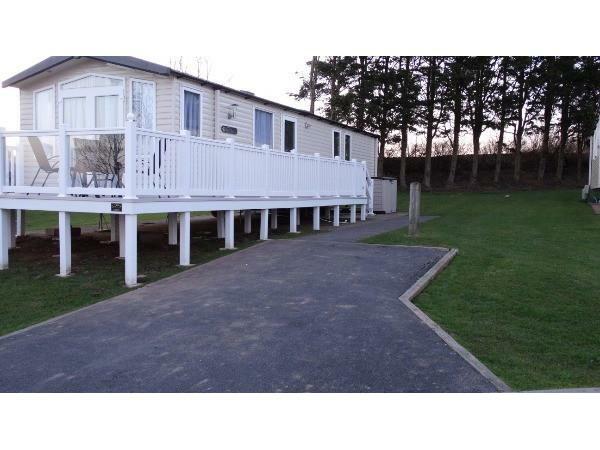 Additional Info: Our caravan is located in a quiet area called The Terraces, and has a private gated veranda, private driveway and great sea views. There is minimal traffic movement, so is a great for children to play safely. We have a large flat screen TV in the living room, a DVD player and lots of DVDs for our guests to choose from. In addition, there are TVs with built-in DVD players in all three bedrooms. We have recently replaced the four single bed mattresses and have replaced the double mattress in the main bedroom with a new orthopaedic mattress. LOUNGE: Our holiday home benefits from a comfortable and modern lounge with free standing furniture and sea views, 42" flat screen TV, DVD, Free view, fixed units and a Gas fire. 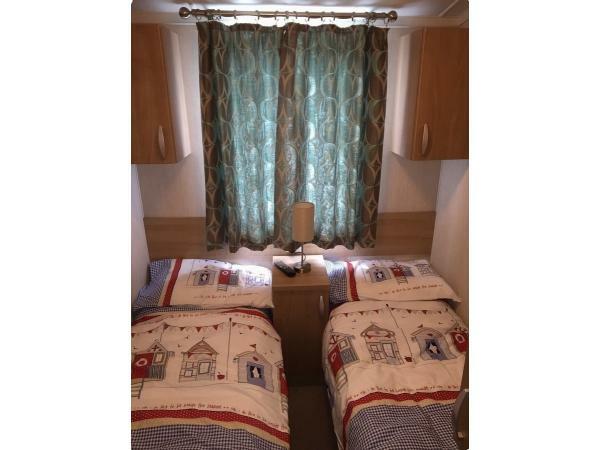 The caravan has central heating and is fully double glazed. KITCHEN & DINING AREA: Our holiday home has been fitted with an modern kitchen which includes built in fridge / freezer, cooker, microwave, toaster, kettle and all crockery and utensils. The dining area has free standing table and chairs. We have also provided an ironing board, iron and a vacuum cleaner. 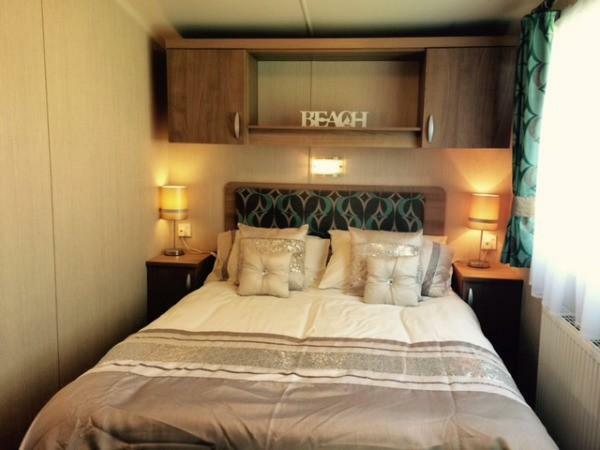 A master bedroom with double bed, fitted wardrobes and 24" TV with Freeview & DVD player. 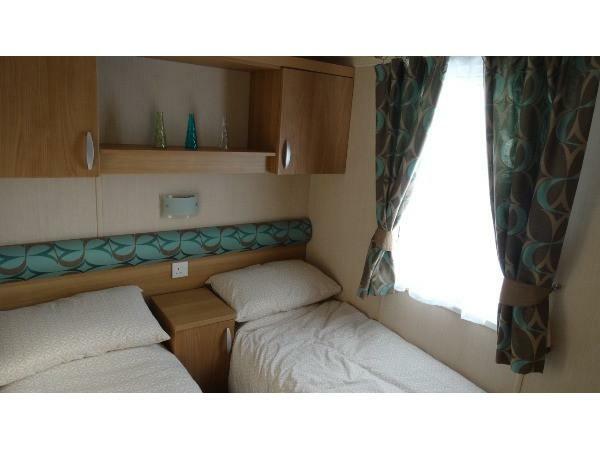 Bedroom 2 has 2 single beds with fitted wardrobe, also comes with a tv, Freeview and DVD player. 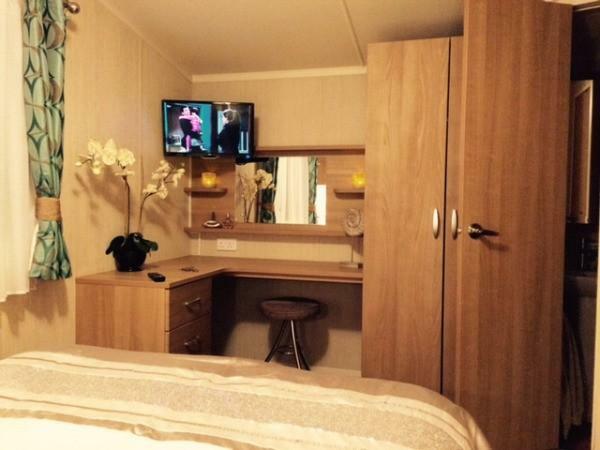 Bedroom 3 has 2 single beds, fitted wardrobe and plenty of storage lockers plus tv, Freeview and DVD player. The twin beds can be pushed together to form a second double bed if required. 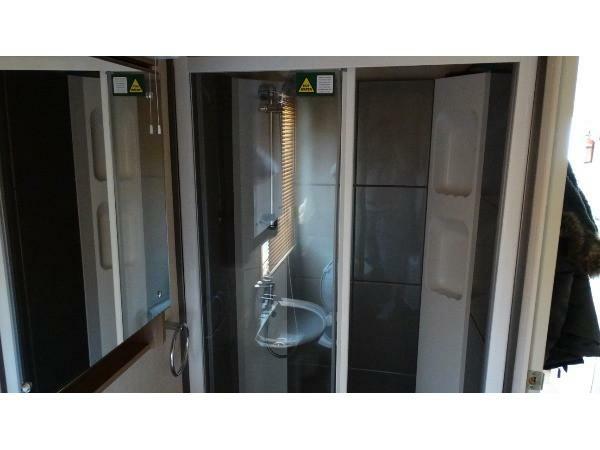 BATHROOM & TOILET: Luxury double shower fitted with glass door, toilet and sink. MASTER BEDROOM ENSUITE: This holiday home has the luxury of an addition toilet with basin, ideal for larger families. HEATING: Our holiday home is double-glazed and has full central heating with radiators in all rooms, this means you can holiday in any season in comfort. PARKING: Our holiday home has its own drive way besides the caravan. CHECK IN: Check in is usually from 2pm with no need to queue for keys as keys are available at the holiday home upon arrival. Check out is usually before 10am on the morning of departure. We are flexible with our holiday home bookings, so please contact us with the days that suit you. Full payment of the agreed amount is to be paid within eight (8) weeks of the date of your stay. 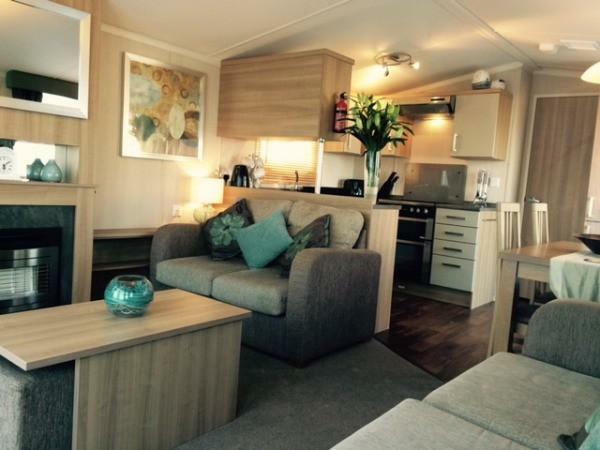 If payment is not paid within eight (8) weeks, we reserve the right to offer the caravan to other parties. If you cancel your stay within six (6) weeks of the date of your stay without justification, we reserve the right to return the full amount less £100 (to cover losses for potential bookings). An additional security deposit of £150 is required to cover any unlikely repairs to either the holiday home or surroundings. The security deposit will be refunded in full following confirmation from either the owner, Newmans or the contracted cleaner that no damage has been incurred during your stay. 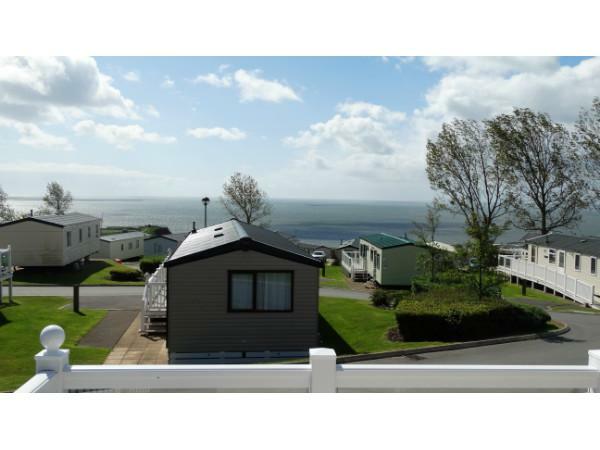 We feel our holiday home has everything you need to a have an enjoyable holiday at Devon Cliffs, if there is anything extra which you need please do not hesitate to ask as we will try to accommodate sensible requests.